Office space is always at a premium, so if you work in a small, medium, or even a large space without the option to expand, you may be running out of creative solutions for storing all the stuff that is essential for your business. Documents, furniture (including seasonal furniture), filing cabinets, and more may be piling up and threatening to overwhelm you. Moving to a larger space is an option, as is renovating your existing space to be more effective. But do not overlook short-term or long-term self-storage unit rental as a great solution to your space issues. Even if you are expanding your space or moving somewhere else, self-storage is a great way to safely store valuables, documents, and furniture during the mayhem of relocating. How do you store stuff effectively without losing track of what things are where? Below, we’ve got some tips to help things go smoothly while you keep business running at optimum levels. Storage should not be a black hole into which things disappear and never return. Carefully decide exactly which items will go to storage and then inventory each item. Include descriptions of each item as well as its final resting spot in the storage unit and keep several copies of your inventory: one stored at the unit, one for general office use, and one for your personal files. Keep the inventory lists updated as you remove or add items to the unit. Never store boxes that have not been labelled on at least the top and one side. It makes sense that things you need more frequently should be easily accessible. Unfortunately, in the hurry to get things stored and out of the way, you might be tempted to skip the step of creating a strategic placement plan that will help whoever is unloading the moving truck or van to put things in an orderly fashion. Plan what will go in the back of the unit (things that aren’t needed at all or needed only infrequently), what will go in the middle, and what will be most easily accessible at the front. Label each item with its final location and load the moving truck or van so that least needed items are loaded last and unloaded first. Expensive equipment, valuable documents, furniture, and textiles should not be left exposed to extremes of heat and cold. A climate controlled storage unit is ideal for your needs as this type of unit will maintain an even temperature throughout seasonal changes. Computers and computer-related technology are especially susceptible to temperature fluctuations, so do not risk damage to your investments even in the short term. By getting things out from under foot but still available as you need them, smart use of high quality self-storage units can be a boon to your business. 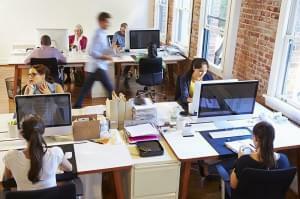 Your neater, less cluttered office space will feel more efficient, which is a big boost to productivity. Value Store It has been helping home and business owners throughout Florida, New York, and Connecticut safely store valuable possessions in clean, easily accessible units in a variety of sizes. Visit our Home page today to find a location and identify the unit that is right for your needs.